(i) This project will provide a test-bed for for graduate students to conduct various experiments for their master theses or PhD dissertations, and for senior stuents to do their capstone design. This project.can educate more engineering students who know advanced technologies in real-time image processing, dynamic system modeling and control, navigation, sensor fusion, and cluster computing. (ii) The short-term goal is to get DARPA fund and bring students to participate the DARPA ground vehicle challenge event. (iii) The ultimate goal is to develop autonomous vehicles that can safely execute missions in a complex urban environment with moving traffic. This project will develop an intelligent autonomous ground vehicle that operates in the urban environment, based on Agent-Based Control (ABC) method. The autonomous vehicle control is a very complicated process. It contains the control of the brake pedal, clutch pedal, steering wheel, and turn signal switch. The human driver integrates these operations tactically based on the recognition and understanding of the environment situations such as traffic light changes, stop signs at the intersections or pedestrian crossings, lane changes, curbstones, sharp turns, parked vehicles. For the autonomous vehicle control in urban environment, the traditional control method is not appropriate because it requires many real-time environment recognition and understanding sub-tasks and many real-time combinational control sub-tasks such as the combinational control of brake pedal and steering wheel, combinational control of steering wheel and turn signal switch, combinational control of steering wheel and clutch pedal. This project proposes the autonomous ground vehicle control based on ABC method. ABC method can distribute the sub-tasks of the entire system, and make it easier to build a robust control mechanism for the autonomous vehicle in the urban environment. 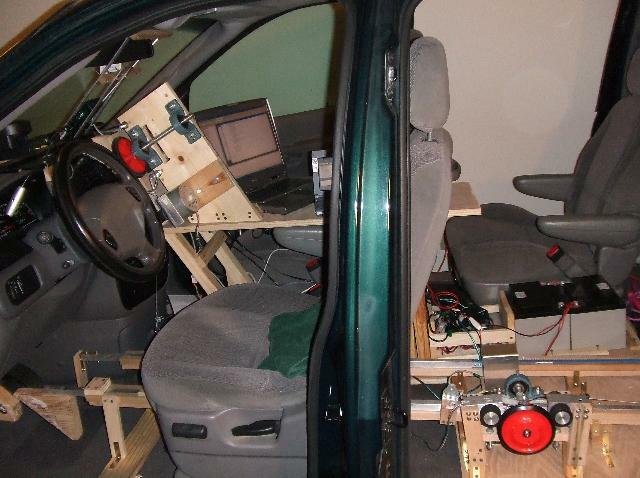 The works in this preliminary project contains the improvement of the prototype autonomous ground vehicle, development of core technology for lane detection and recognition, circumstance environment understanding, control of the steering wheel and brake pedal, navigation based on GPS and video camera.